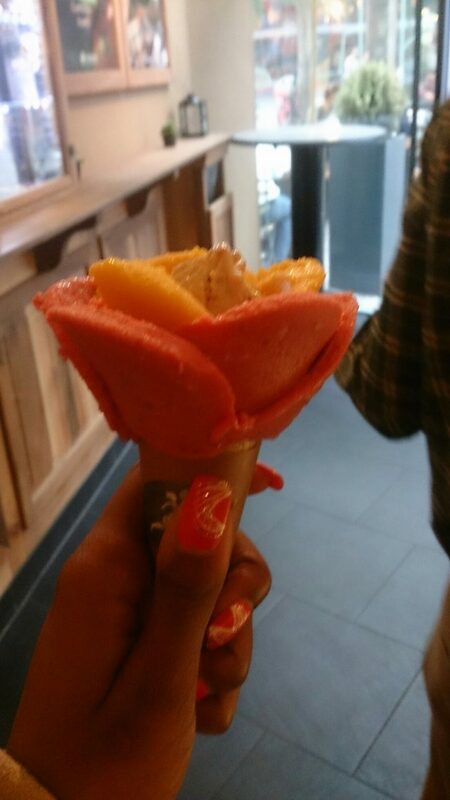 Despite discovering it in Berlin, Amorino actually offers a selection of Italian gelato. The menu looks pretty usual however how it is server is entirely unusual. The main thing that I found exciting was that “one scoop” does not necessarily mean one flavour. I was surprised by how much warmer the weather was Berlin compared to London so I took regular breaks whilst touring to take in the sights and enjoy a refreshment. I was so grateful when I finally found an ice cream parlor and which I have to say, had visually the best ice cream around. In London there are two Amorinos local to me both fairly new so I was way ahead of the game by visiting one in Berlin. I think my photos say it all and if you are wondering, yes it tastes as good as it looks. Originally I thought one scoop meant one flavour, it doesn’t! If you are going for a small cone then three flavours is the way to ice cream in style. They have a great selection of flavours and the staff do all this with a flat metal instrument by hand. They do it so quickly you hardly get to see what happen and before you know it, you have a perfectly edible flower. If you haven’t visited one I would recommend going if you fancy an ice cream and a coffee this season. Why don’t you share your ice cream photos with me when you do.